Are you ready for the start of the Winter Sport season? The weather might be getting a little chillier, and the sky a little greyer…But never fear – because Winter sports are back on! Popular sports during the Winter season are, of course, the four football codes – AFL, Rugby League, Rugby Union and Soccer. Netball and hockey are also incredibly popular during the cooler months. These sports are a great way to stay fit and warm up during a time when it is very tempting to stay at home on the couch! Are you involved with a Winter sport through a school, council or sports club? Run through this checklist to see whether you are prepared for the new season. Do the goal posts have have any evidence of rust or damage? Are the goal post sleeves filling with water that could cause future rust? Are the goal post sleeves are secure in the ground? 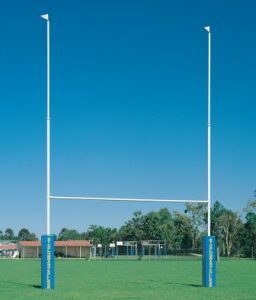 Is all goal post padding are in place and in good condition? Is the surface free of debris? Have weather conditions or water made the surface unsafe? Are sprinkler covers correctly in place? Are ground markings safe & a sufficient distance from fencing and other structures? Is sports equipment safe & in good condition? Are all court/field lines clearly marked or do they need a refresh? Are the facilities free of debris? Is seating clean and safe? Are the changerooms & referees facilities safe and hygienically clean, particularly showers and toilets? Is hot water working for shower facilities in player & referees rooms? Is there a sufficient supply of ice? Is there a sufficient supply of drinking water and/or soft drink for both competing teams and referees rooms? 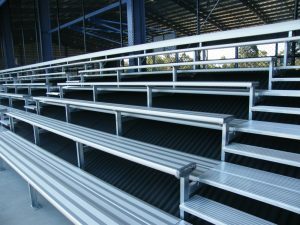 Are benches and tables provided and in safe condition? Are toilets well maintained, hygienic and adequately stocked? Are waste bins provided and placed appropriately? 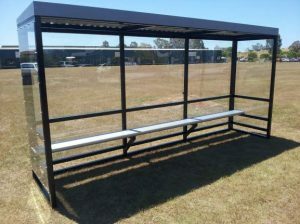 Do you need new player shelters or spectator seating? Request an online quote now! Is a Jordan Frame stretcher provided on site? Is the stretcher location known to teams involved? Is a qualified first aid officer present? Is a telephone available for emergency use, together with emergency numbers being known? Have first aid kit stocks been checked against an appropriate check list, with ice available? Is an ambulance present at the venue while the match is in progress with clear access to arena? Is medical area for club doctors clean and sterile? Do first aid officers know the location of the nearest hospital and medical centre? This list is designed as a starting guideline, as each sports club will have their unique requirements. Hopefully it will get your mind ticking over and help you prepare for the season ahead. If you have any questions about sports equipment requirements, don’t hesitate to contact Grand Slam on 1800 773 461 or sales@grand-slam.com.au.